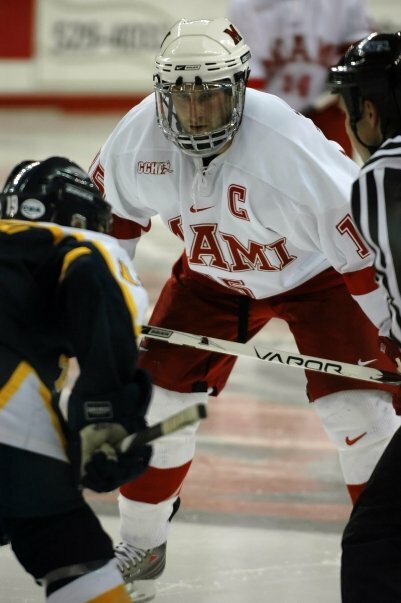 > The Cincinnati Cyclones announced today that the team has signed defenseman Kevin Roeder for the 2009-2010 season. Roeder, the definition of a “stay at home defenseman,” has been one of the most exciting players in Division-1 hockey over the last four years, largely due to his leadership, playmaking ability, and hard hitting. He finished his Miami career with a plus-50 rating and 36 points in 152 games. 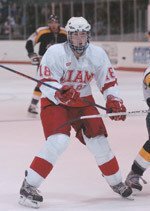 Although his claim to fame won’t be one that he’d like to remember, his consistent play each weekend made him into one of the top players on a very good RedHawks team. 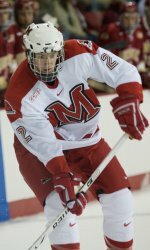 Roeder is the ninth player from Miami University to don a Cyclones sweater and the first since the franchise returned to Cincinnati in 2006. He follows in the footsteps of Dan Boyle, Chuck Thuss, Chris Bergeron, Ryan Brindley, Tom Neziol, Josh Harrold, Dan Beaudette, and Evan Cheverie. The Cyclones open the pre-season on October 9th, as they hose the “returning” Toledo Walleye (formerly the Toledo Storm). Congratulations to Kevin! Here’s hoping this is just the start to a great pro career. He was invited to the Columbus Blue Jackets’ training camp and is currently in Traverse City, Michigan playing in the organization’s prospect tournament. In his first game on Monday night, he registered one assist. For more Cyclones coverage, make sure and check out CycWords. > The 3 finalists for the CCHA individual awards have been announced and two RedHawks, Carter Camper and Kevin Roeder have been nominated. Camper was nominated for the CCHA Player of the Year Award, along with UAF goaltender Chad Johnson and Notre Dame goaltender Jordan Pearce. Some tough company there. Camper was also nominated for the Defensive Forward of the Year, joined by U of M’s Tim Miller, and Notre Dame’s Erik Condra. Roeder was nominated for the Best Defensive Defernseman honor. Also in that group is U of M junior Chris Summers and Notre Dame junor Kyle Lawson. 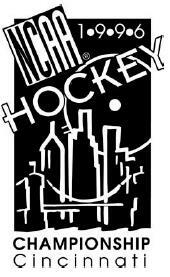 The winners will be annoucned on Thursday, March 19th during the CCHA Awards Banquet at the Fox Theater in Detroit. This weekend’s games will be televised on ONN, with Dave Allen and Kevin Ackley handling the broadcast duties. 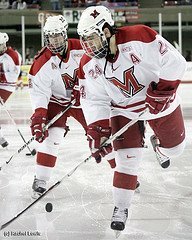 This is your last and final chance to see your Miami seniors take the ice at Cady Arena. >On the heels of two Miamians being named to the CCHA All-Rookie team, another honor comes along today, as junior forward Brandon Smith was selected as Miami’s scholar athlete. Smith, who carries a grade-point average over 3.70, is now one of twelve finalists for the league award (one player is selected from each CCHA team.) 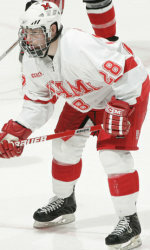 The winner will be announced on March 19, as a part of the 2009 CCHA awards banquet. Congratulations to Brandon. It has certainly been a season of career firsts for the hard working Pepper Pike, Ohio native. Also, for those out there into online chatting…seinor captain Brian Kaufman and alternate captain Kevin Roeder will take part in an online chat tomorrow morning (Thursday) at 11:00am. You can link to the chat form by clicking here.